Posting will be light this week as I head op to Kaedrin North for a respite from the daily grind. 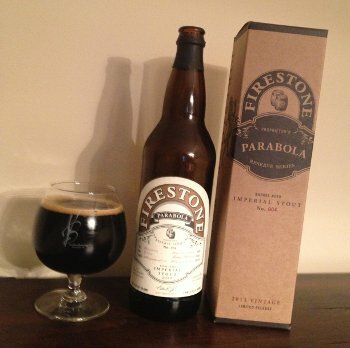 I really kicked the vacation into gear a couple days ago with a Firestone Walker Parabola, a beer which I had inexplicably "only" granted an A- to last year. Let's up that to an full-blown A, shall we? "But it is a curve each of them feels, unmistakably. It is the parabola. They must have guessed, once or twice--guessed and refused to believe--that everything, always, collectively, had been moving toward that purified shape latent in the sky, that shape of no surprise, no second chances, no return. Yet they do move forever under it, reserved for its own black-and-white bad news certainly as if it were the Rainbow, and they its children...."
See you next week, though I'm sure I'll post a thing or two on twitter, in case you're afraid of withdrawal. This page contains a single entry by Mark published on August 13, 2013 11:11 AM. Weyerbacher Double Feature was the previous entry in this blog. Operation Cheddar is the next entry in this blog.